UCC knows squash. Our teams have won provincial and national titles and players have gone on to earn places on North American university teams. At the Upper School, boys can play for the U14 and U16 teams before moving up to the varsity team. Practices and tryouts begin in November and Conference of Independent Schools Athletic Association (CISAA) play starts in early January. Matches are on Wednesday afternoons in January and February, leading to the CISAA championships in the last week of February or first week of March. 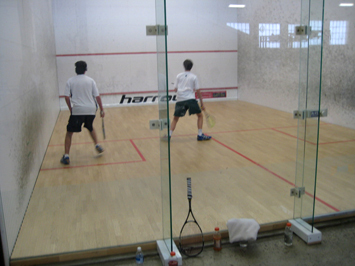 UCC has no squash facilities, but uses the first-class courts at the nearby Dunfield Club for practices twice a week. Home matches are played at the prestigious Mayfair Lakeshore Club. Boys of all levels are encouraged to try out for the U14 program. The sport often suits boys who are more comfortable playing an individual sport in a less heated competitive environment. Many do well on the U14 squad and graduate to the U16 team.